The Lady Wolves celebrate after scoring a point. Last weekend, the varsity volleyball team advanced to the State playoff semifinals for the first time since 2007 after defeating Naaman Forest, Midway, McKinney, The Woodlands (the number one ranked team in the state), and district 9-6A rival Prosper in the Regional playoffs. The Wolves are the 15th ranked team in the nation and the third-ranked team in the state. 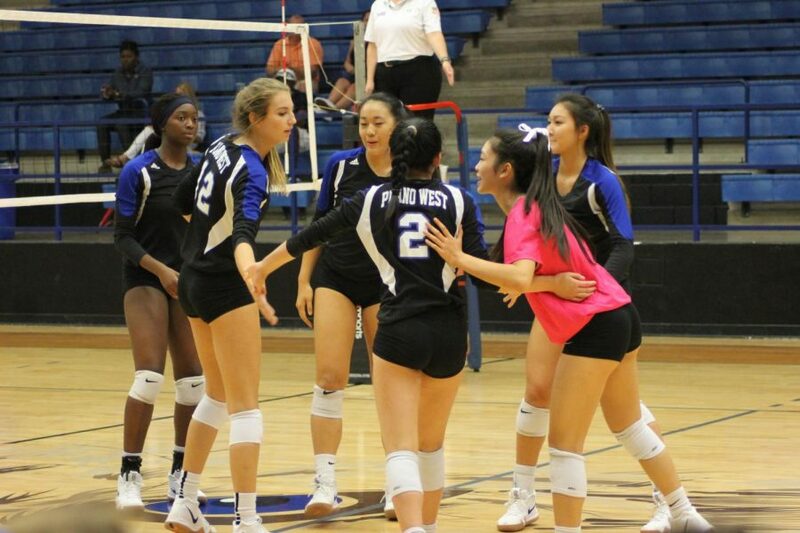 In the semifinal game against Prosper, the Wolves won the match 3-1 by defeating the Eagles 25-17, 25-11, and 25-20. This year, the team was led by Iman Ndiaye, who has committed to Penn State University and Jill Pressly, who has committed to DePaul University. This season, Pressly finished third in the area in kills with 617 as well as fourth in blocks with 41, while Ndiaye finished one spot before her in kills with 548 and one spot ahead of her in blocks with 47. The Wolves also received support from senior Haley Hoang, who has committed to Northwestern State University, and junior Ashley Le. Hoang led the team in digs with 539, while Le finished with the most assists on the team with 708. The Lady Wolves finished the regular season with a 40-9 record, losing to Keller (preseason), Flower Mound Marcus, Flower Mound, McKinney Boyd, Southlake Carroll, McKinney, Plano, and Prosper (twice). They also finished 9-4 in district play, ranking them as the 15th best team in the nation and the third best team in Texas. West’s opponent tonight, the Ridge Point Panthers (Missouri City, Texas), finished the regular season with a 46-5 record, only suffering losses to Oak Ridge, Flower Mound, Pearland, O’Connor, and Kingwood Park. The Panthers won a total of 120 sets, and only lost 28. Junior Claire Jeter leads Ridge Point in kills and total blocks with 410 and 139, respectively. Sophomore Karly Jackson leads the team in aces with 50, Nia McCardell leads the team in digs with 758, and Kendall Sekula leads the Panthers in assists with 798. Plano West and Ridge Point are both 1-1 against common opponents, having both lost to Flower Mound (PW lost 3-0, RP lost 2-1) and both defeating The Woodlands (PW 3-1, RP 2-1). The team scoring averages are almost identical, but Ridge Point edges out West in average wins, with the Panthers recording 2.4 to the Wolves’ 2.2. Senior setter Sedona Giambalvo spoke on what the Wolves need to do to secure a win against Ridge Point. Plano West and Ridge Point will face-off at the Curtis Culwell Center in Garland at 5 p.m.
You can watch the game live by clicking here.